8 shooting workouts for perimeter players. 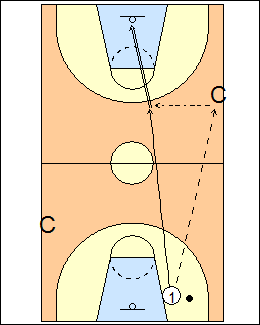 Make one move 3 times up the side, take a three-point shot, repeat coming back on the other side, take another round trip, make 3 out of 4 shots to move on to the next dribble move. Progression - start on the other side with the other hand. See Dribbling - 5star point guard push, Shooting - 5star fullcourt, 5star fullcourt conditioning, Lee Rose fullcourt, Tony Watson series (Commando). 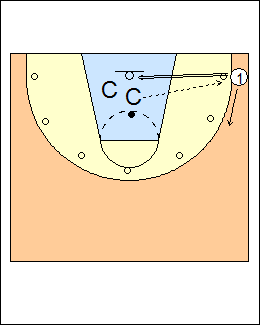 Advance pass to coach, sprint for a return pass and 3-point shot, rebound, repeat coming back on the other side, continue, make 6 out of 10 or start over. See Fast break - DeMatha transition shooting, Shooting - Kevin O'Neill on the move, Lee Rose pre-game, Kelbick quick shot. Go hard, make a move, go past coach body-to-body to the rim, make the same move coming out on the other side, repeat from there. 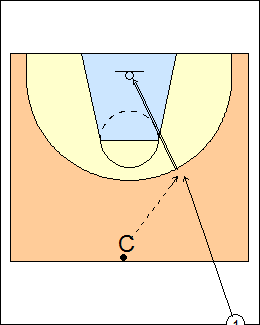 Experiment with different moves - hesitation, crossover, inside-out, inside-out crossover, make up your own. Progression - pull-up jump shots, 15-footers or 3's. 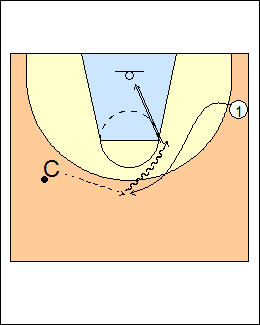 See Dribbling - Kevin O'Neill moves, Layups - Villanova, Primary-secondary moves. V-cut to the top of the key, catch, rip-thru opposite for a pull-up. Do the same thing on both sides. 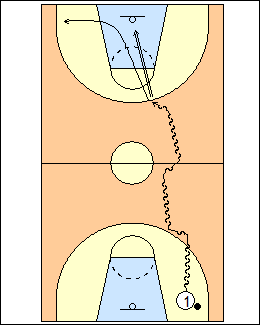 Progression - catch, rip-thru opposite, make a change-of-direction dribble move for a pull-up jump shot (crossover, between the legs, behind the back). See Shooting - Tom Crean fill cuts, 5star on the move, Continuous. 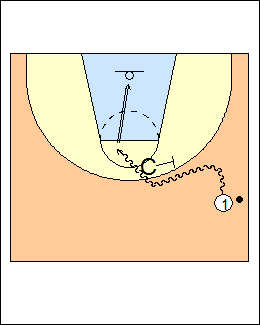 Make a dribble move from halfcourt, shoot a 3, cut to the top of the key for a pass and another 3, alternate sides. Challenge yourself, e.g. make 7 out of 10 or it does not count. - catch, rip-thru opposite, make a change of direction move for a pull-up. Shoot from one spot at a time, e.g., for one minute, or make 10, or whatever you want. Set goals and keep track. - ball fake, go left to the rim. 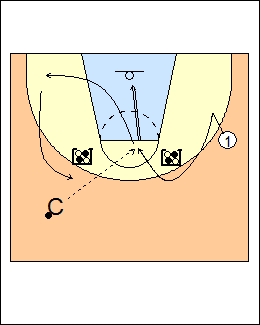 See Shooting - Billy Donovan solo and partner, 5star pairs spot, Triano 7-spot workout. 3's are worth 3, ball-fake pull-ups are worth 2, layups are worth one, move all around the perimeter, you can't shoot the same shot or from the same spot twice in a row, get to 21 points. - work in pairs, alternate shots. Taylor Allan - Allan Houston drill - solo shooting, how many 3s (or 2s) can you make in one minute. See Shooting - Florida 21, 32, Move, Pro Training solo (fullcourt hotshots). Move back and forth from spot 1 to spot 2 for one minute, continue for spots 2 and 3, etc. 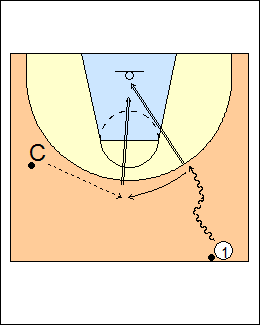 See Shooting - Billy Donovan partner (square-up), Duke windshield wiper. 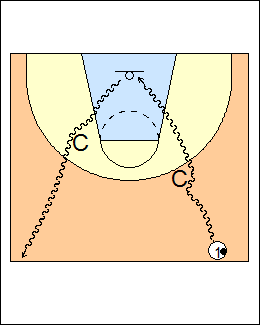 Sprint from 3/4-court for a pass, catch and shoot, alternate sides. - ball fake, one dribble left, pull-up. 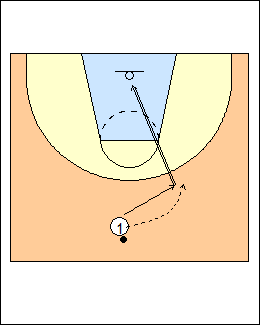 See Shooting - 5star transition, Duke transition, Memphis guards. Dribble to the level of the screen, go body-to-body for a pull-up jumper. Alternate sides. 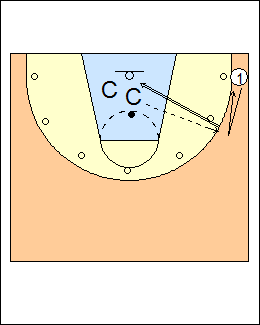 See Shooting - Mike Procopio sidescreen, Dave Smart 1 on 0 sidescreens. Use two chairs at the elbows extended, curl off a chair for a catch and shoot, go to the opposite short corner, curl off the other chair, continue until you make your goal, e.g., 8 out of 10 or 6 in a row. - bump and fade (your defender goes under the screen). See Shooting - Eastman elbow pickups. - change of pace or step-back move, vary the timing. See Shooting - 5star circus, 5star jab series, 5star box, Spot, Nash 3-spot, Frankston spin-outs, Mike Procopio wing, Footwork - Jay Wright jab-swing series.